My definition of “Game of the Year” is “if you can only play one game from the year, make it this one.” That’s not the same as highest production values, or most replay value, or best multiplayer. Instead it’s about more interesting assets such as expanding the medium, trying new things, and providing unique experiences that you’ve never seen before in games. Once you’ve played one Halo game, you’ve more-or-less played them all. You won’t really be missing anything if you skip it this year. 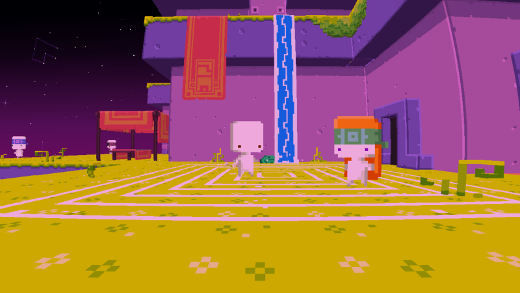 But you will be massively missing out if you choose not to experience 2012’s Game of the Year: Fez. 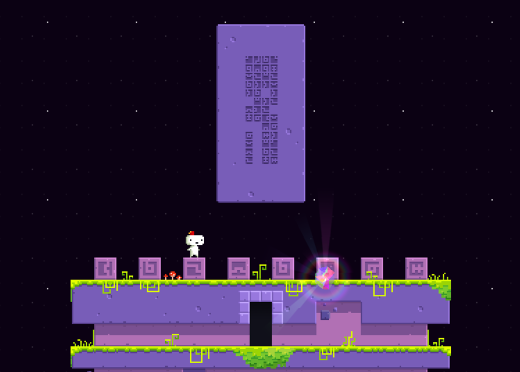 I think Fez invokes the same mystery and fascination in discovery that made the Myst series so popular and powerful. You’ll notice things as you make your initial exploration through Gomez’s world, and they’ll seem decorative or meaningless. Only after you’ve gone through enough of the world will you start to understand why they’re there and what they mean. Just like in Myst–that’s not decoration, that’s a clue! My roommate and I played through the game over the course of a month, sitting on a couch with a notepad between us and trading the controller every now and then. The game is a little heavy on retracing your footsteps, which is both a good and bad thing. Like I mentioned, you’ll notice new things as you traverse through old areas. Warps might contribute to your missing vital clues. But it does get old jumping through the same platforms over and over as you switch between two areas comparing notes. 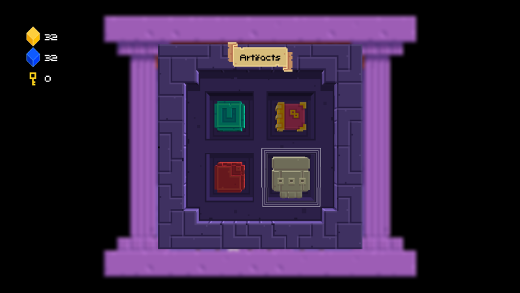 But the puzzles are wide, varied, and ingenious enough to make up for the moderately repetitive gameplay. The game is hard, but completely accessible. Between the two of us working together, we only had to look up the solutions to two puzzles, one of which actually remains unsolved to this day. The art is astounding. It takes SNES-era pixel art to the extreme, and then stacks a whole other physical dimension on top. Take the time to take in the art as you go through the levels. Notice the trees with hundreds of leaves; the blades of grass perfectly reproduced from any angle; the unique indentations in each of the game’s blocks; the little wildlife creatures that bring activity into each area of the world. 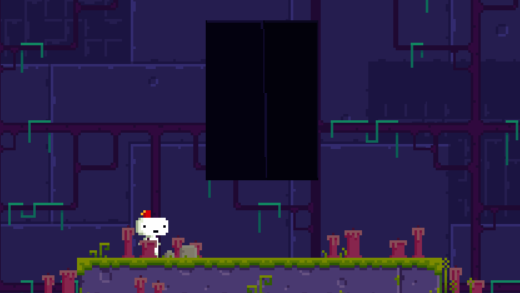 It is a massive shame that Fez will probably never see a release outside of XBox Live Arcade. I would love to be able to come back and re-experience this game ten years from now, dragging hints of puzzle solutions from deep in my memory and re-discovering the hundreds of nooks and crannies this game has tucked away. 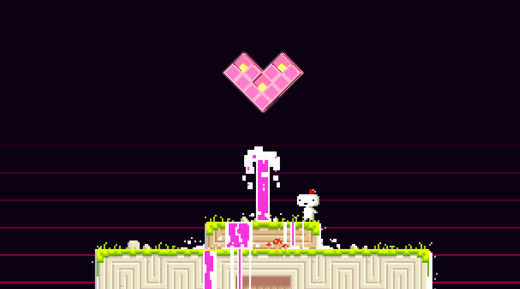 But I wouldn’t be surprised if Fez is unplayable as soon as five years from now, as Microsoft migrates their servers to whatever platform is current in the late 2010s. Your XBox sitting in storage won’t last ten years, you will have no way to re-download the game onto a replacement XBox, and it will be lost to the annals of DRM and cheap technology. A PC release would at least allow the game to exist in the shady corners of the Internet where we currently find SNES ROMs. Perhaps there will be a DRM-free and cross-platform release through Humble Bundle to save the game from the passage of time. The game’s developer has said that the exclusivity period with Microsoft has expired. Nothing’s impossible, and this game deserved to be played years and years from now. 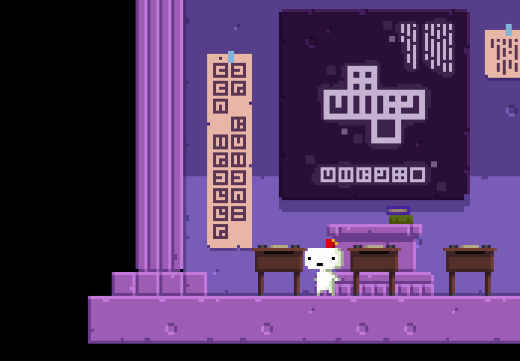 If you only play one game from 2012, make it Fez. Journey only missed out on being my Game of the Year because it was released in the same year as Fez. I actually hadn’t heard about Journey until the soundtrack was in the news because it was up for a Grammy award, so I played it months late. I read a review or two and instantly knew I had to play it. It’s short, designed to be consumed in one sitting, like a movie. I played it at night with the Grammy-nominated sound track turned up loud and a glass of wine to accompany me during the cutscenes between levels. I won’t delve into the details of the multiplayer aspect, as that would kind of be a spoiler in itself, but I will say that probably my favorite gaming moment of the year was watching a complete stranger deftly draw a heart into the sand before spiriting off into the end credits and out of my console forever.